Hello my name is BettyAnn Allston. I spent many years as a working mother, struggling to do what was right and to make ends meet. As I began to study the Bible myself my relationship with Christ grew and my life took on new meaning and purpose. I entered college late in life and earned my degree in education, B.A. Ed., Washington State University. I am using my experiences in life, my experiences as a classroom teacher and my love for worship with music to serve at ABCU Liberia. My name is Claudia Lopez and I was born in Tegucigalpa, Honduras. With two parents, and a plethora of family members in education, teaching has been a life-long passion and blessing. I am certified in Spanish and English with K-12 licensure, but focus on Language Arts. Challenging students to be critical thinkers, active readers, and strong communicators is the core of my instruction. If you visit my class, you should see students working in small groups or sharing their ideas in a open and supportive environment. Mostly, learning should be engaging, encouraging, and extend beyond my classroom and our school hours, so I want to foster that love for education in every class. 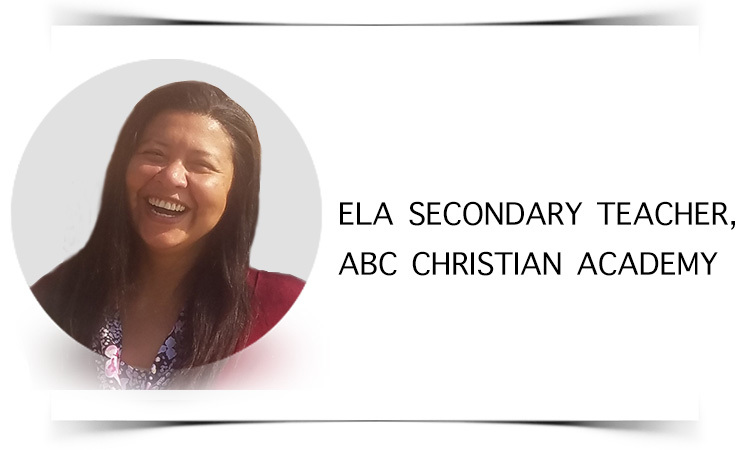 It is my extreme honor and profound joy to teach the wonderful students at ABC Christian Academy. Hello my name is Ryan Allston. I spent most of my life living and working in Washington State, USA. I worked in public education for over 30 years. I have a M.Ed. from Eastern Washington University. In 1996 I came to faith in Christ Jesus and my life was radically transformed. My wife, BettyAnn, and I are following the call to disciple brothers and sisters in remote parts of the world. We began serving at ABCU Liberia in 2017. Although our intention is to serve others, we find that those we are intending to serve enrich and bless our lives. Hi! I'm Marlene Schimke. I grew up in a Christian home on a ranch in Eastern Colorado. While studying for a Communication degree at Dordt College in Sioux Center, IA, I spent a semester studying abroad in Costa Rica. This opened my eyes to the concept of taking the gospel to other parts of the world in a way I'd never seen before. After doing some short-term missions training and projects in Mexico and Kenya, I believed God was calling me into full-time mission work. My husband, Kurt, and I have been with ABU in Uganda since 2006, where we are raising our four children. It's a privilege to share what God has graciously given me throughout my youth to help disciple others for their future. My name is Lauren Spencer. I am from St. Louis, MO, USA. I graduated from Covenant College with my BA Psychology and received my Master's of Arts in Counseling from Covenant Seminary. I am a PLPC working towards full Counseling licensure. Though I have my Counseling degree, I am currently teaching Math at the College which is a lot of fun. My husband and I have 2 cute sons and we love to do Ministry together as a family! I am Alfred Dzaoneni from Lilongwe, Malawi. I have 9 years of broadcasting experience especially in radio. I am an alumnus of African Bible College (Uganda Campus) with a Bachelor of Arts Degree Majoring in Biblical Studies with a Minor in Communications. Currently serving as a Radio Presenter for Radio ABC, Uganda, 99.3 FM. I am passionate in living for Christ and serving him in cross cultural missions. My name is Sean Kinsella, husband of Natasha. We are from Cambridge in England, where we are also members of Cambridge Presbyterian Church. I hold a B.A. Hons. degree in American Studies with History from Northampton University, and A Post Graduate Certificate of Education in Primary School Teaching from De Montfort University. More recently I attained a Master's Degree in Education (International) from Keele University in England. 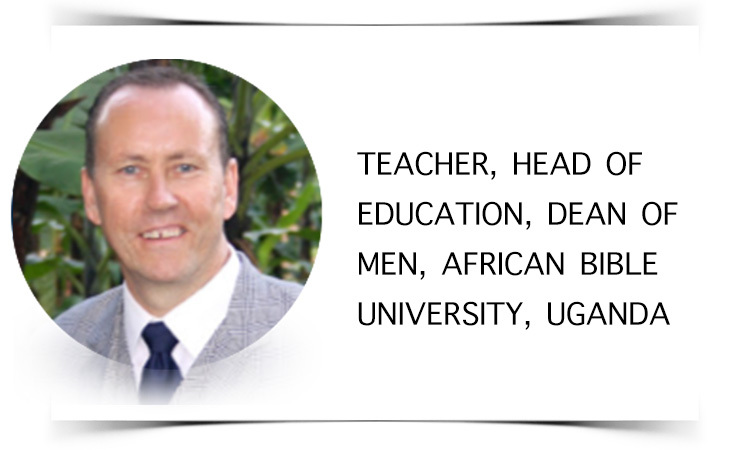 There is no doubt, teaching is my vocation and calling, and I praise God for His call to Africa and the opportunity to serve Him at African Bible University, Uganda. My name is Natasha Kinsella, wife of Sean; originally from London UK and a member of Cambridge Presbyterian Church. After graduating with a degree in Applied Chemistry, I worked in the pharmaceutical industry for eighteen years, as a Medicinal Chemist. In 2013, God called Sean and I to Uganda, where I gladly serve my Saviour as an administrator. My name is John Carson. I am married to Sarah Ellen – we celebrated our 50th Wedding Anniversary at ABU in Kampala. We have 4 children (all of whom are in Christian ministry) and 10 grandchildren (all of whom are being taught God's Word and discipled in their homes). God has called me to Himself and equipped me to preach and teach His Word – Erskine College (B.A. ), Reformed Theological Seminary (M.Div. ), Aberdeen University (Ph.D.). 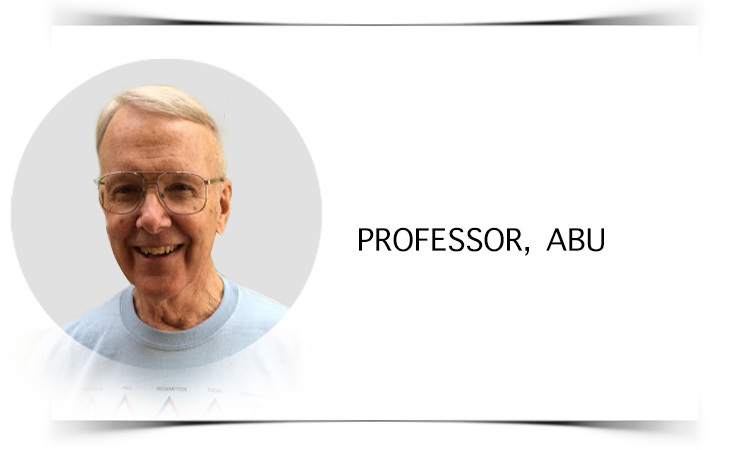 He has used me as a Pastor (2 Associate Reformed Presbyterian churches), Professor (Erskine Theological Seminary, Mobile Theological Training Team) and President (Erskine College and Seminary). Now God is using me to teach on the mission field – something I felt called to do when God called me to Himself – but He had a few other things He wanted me to do first. I love using graphics in my teaching as you can see from the design on my shirt. Sarah Ellen has the gift of hospitality and she loves having students in our home. 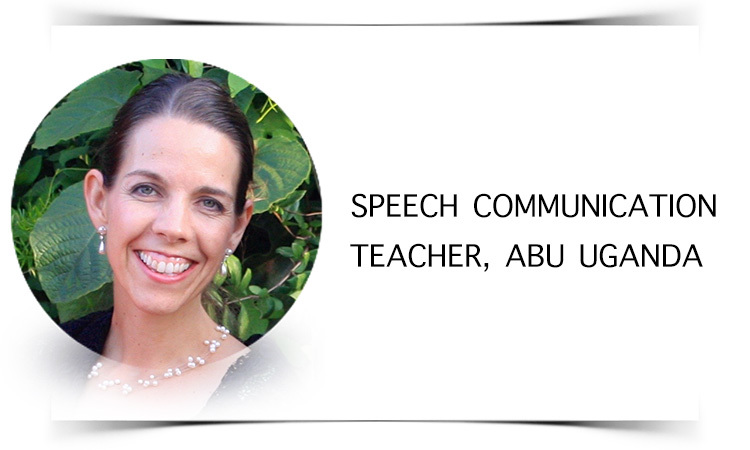 Lecturer and assistant dean of academics ABCU Liberia West Africa. My name is Armah G. Karmoh. I am a Liberian from a town called Fagalahum in Lofa county North West of Liberia. 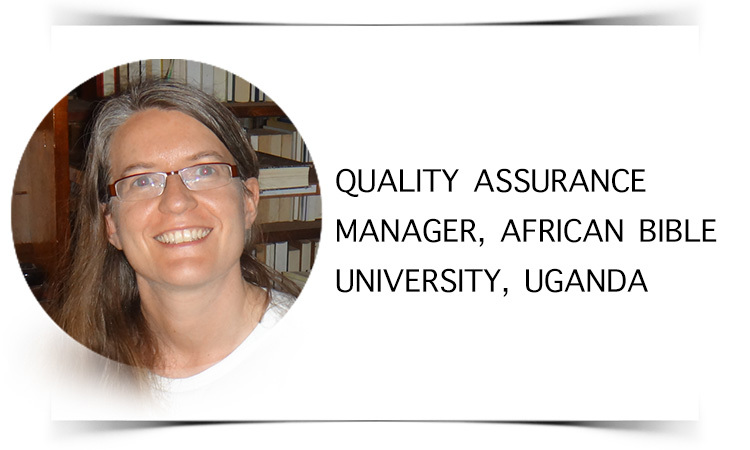 Armah is a graduate of ABCU Liberia, and a 2018 graduate of the Africa International University in Nairobi Kenya. I am a minister of the gospel of Jesus Christ born in a family of gifted teachers. My greatest heart desire is that my life will be use by the LORD to contribute to holistic human resource development. Armah G. Karmoh has MA in Education with emphasis in Curriculum and Instructions. I feel fulfilled when I see my students integrating their Christian faith in their professionalism and every aspect of their lives. I am still trusting the LORD to provide for my Phd studies. List: Kayla Soukup, Madison, MS, Bachelors of Science in Elementary Education from Mississippi State University, I love all things Science-related and am passionate about teaching students how faith and Science go hand in hand.